2009 will go down in gardening history as the year of the vegetable – not since the last depression did vegetable seed sales surge more than thirty percent in a single season. Whether for flavor, to save money, put food safety worries to rest, or simply for the joy of cooking fresh from the garden, people are embracing the idea of growing your own. ‘Feisty’ is a new pea, sweet-tasting with more tendrils than leaves on thirty foot vines. This makes it easy to see the peas when it’s time to pick them, and the tendrils are spring delicacies, delicious in salads or lightly steamed. 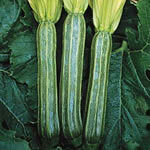 ‘Portofino’ is a dark green and white striped zucchini with a long slender shape that slices into star-shaped rounds. Its flesh is crisp and nutty-tasting. Now there’s a showy little eggplant that might actually ripen in Seattle! ‘Gretel’ is one of four vegetables chosen this year as an All American Selection, in part because it’s a quick ripener, vital in our less-than-hot summers. ‘Gretel’ is ready to harvest 55 days after planting, when the glossy ivory fruits are just 3-4 inches long for a baby vegetable treat. The fruits are nearly seedless, and the plants are compact enough to grow in containers. Give them as much sun as you can find, stake them up, and hope for heat.